Celebrating 65 years of supplying the best manufacturing equipment! 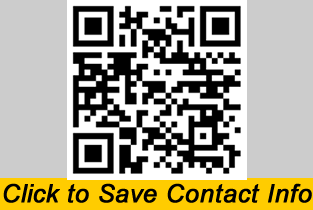 TECHNICAL DEVICES COMPANY has the MOST EXPERIENCED and HIGHEST RATED Customer Service Department in the Industry! 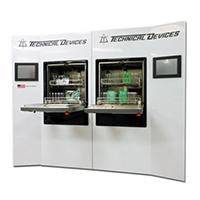 Technical Devices Company is committed to research and development of new and existing products that will continue to exceed expectations of our customers. Our dedication to industry is to listen, respond, and work together for a better tomorrow. 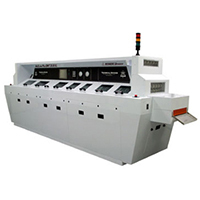 Technical Devices Company provides the best quality machines for production. We offer cutting edge technology, reliable machinery, and excellent value throughout our product line. Our customer service and support are unmatched by anyone in the industry. Since 1952, Technical Devices Company has continued to maintain the highest values established by our founders: Applying quality to all we do and maintaining profitable growth, while partnering with our customers and our employees to remain on the leading edge of manufacturing technology. We offer the latest technological advances in cleaning including touch screen controls, cascade water knives, and high efficiency drying. The insulation and exhaust systems make the Nu/Clean the quietest and most environmentally friendly cleaner available today. Our first Aqueous Batch Cleaner was made in 1991 and we have come a long way since then. Today’s Nu/Clean Aqua Batch Cleaners feature the shortest cycle times we have ever offered — as short as 20 minutes! The right balance of pressure and flow make cleaning and rinsing super effective. The optimized heating and drying in the Aqua Batch will get your boards clean and dry in record time. 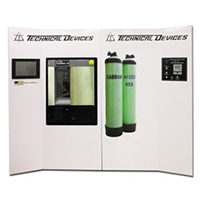 Technical Devices Company offers several different DI Water Recycling Systems for your Zero Discharge, Closed Loop Cleaning needs. The Nu/Clean 510 accommodates large sized media beds and easily supplies DI Water to a full sized inline cleaner. Our Nu/Clean DI Elite or Nu/Clean DI Elite Plus are smaller sized and can easily supply DI Water to any batch or small inline cleaner. All of our DI Water Recycling Systems integrate directly with the Nu/Clean family of cleaners for easy operation and monitoring. The ONLY imported soldering equipment supported by an American Manufacturer. The ONLY machines backed by a network of service personnel with Years of Experience installing and servicing wave soldering equipment. 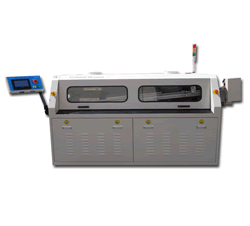 The ONLY imported machines made to the high standards of Technical Devices.